SSO is an authentication service that permits a user to use one set of login credentials to access multiple applications. To avoid security risks by using multiple users' login credentials for multiple applications and to manage users' access to these applications, organizations enforce Single Sign-On. Only admins of HappyFox Chat account have access to configure Single Sign-On. Single Sign-On is available only on Enterprise plan. How to enable Single Sign-On? Go to Manage >> click Security tab. 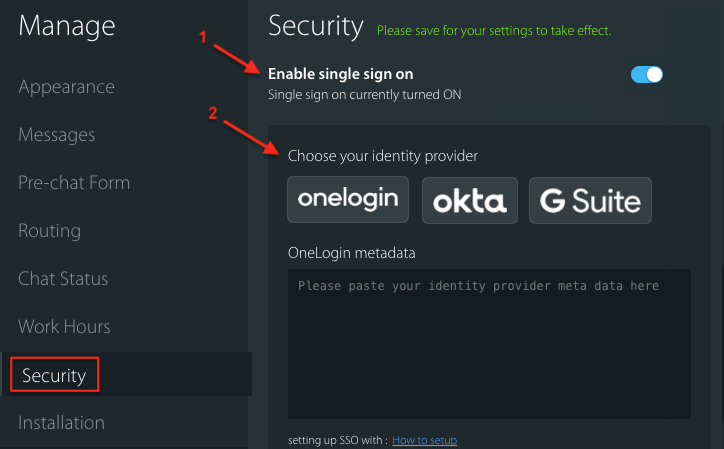 Toggle ON the "Enable Single Sign On" setting and choose your identity provider. Note: We currently support identity providers like OKTA, OneLogin and G Suite. To configure OKTA in your HappyFox Chat account - Click here. To configure OneLogin in your HappyFox Chat account - Click here. To configure G Suite in your HappyFox Chat account - Click here.